Joseph Piotrowicz of Lansdale was randomly selected as the Grand Prize Winner in the 2018 PAPGA Football Sweepstakes. 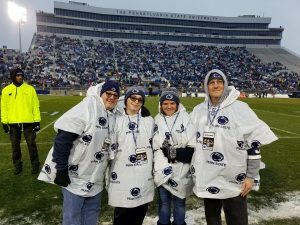 Joe and family enjoyed an experience of a lifetime in State College as the Nittany Lions defeated Maryland on Senior Day at Beaver Stadium. They also won a prize pack, two nights stay, a field visit, tickets to a pre-game hospitality tent and of course four great seats for the game. PAPGA would like to thank everyone who entered this year’s sweepstakes and look forward to another great event in 2019.